©Reprinted by permission of ANDREWS MCMEEL SYNDICATION. All rights reserved. What a week for Paris to Pittsburghers, and honorary citizens everywhere who are working to prevent and protect against climate change. • Last week, National Geographic aired “Paris to Pittsburgh,” about how localities in the U.S. are moving toward a green future. If you missed it, there’s still a few days to stream the movie for free on YouTube. • Just last night, the U.S. and 200 countries agreed on the “rule book,” the next steps in the Paris Agreement on climate change. 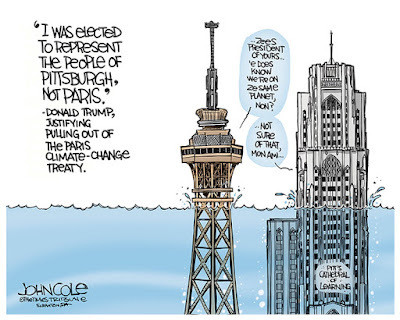 In the film, Pittsburgh Mayor Bill Peduto described his doubletake in June 2017 when his phone pinged with President Trump’s news that he was elected “to represent the citizens of Pittsburgh, not Paris” as his reason to exit the Paris Agreement. The film was for me was a horrifying but also hopeful look at what Miami, Pittsburgh, and Iowa, for example, are doing to move to combat climate change. For many, going green is making common and economic sense. For Miami, though, it may be too late. Like this blog post? Then please share! Don't like it? Please comment (nicely). Want to follow this blog? Enter your email address into the “Follow by email” box. Rose Marie Burke, an editor and journalist, writes a blog about her personal insights into life in Paris. After 20 years in the City of Light, she still calls her native Pittsburgh "home." You can also find her on LinkedIn, Facebook, or Google+. That has a nice ring to it, but global warming doesn’t care whether you’re from the Steel City or the City of Light. That’s why cities like Pittsburgh across the U.S. aren’t waiting for Washington to wake up to climate change. They have been moving toward green futures and acting to save or protect their communities from extreme weather. Their words and work are featured in the new documentary “Paris to Pittsburgh,” to be released at 9 p.m., Wednesday, Dec. 12, in the U.S. as a National Geographic film. You can see the trailer here. Later the film will eventually make its way to Paris as well as 171 other countries. 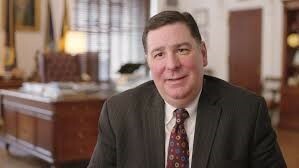 The mayor of Pittsburgh, Bill Peduto (pre-beard! ), gets a lot of air time in the documentary. “There are now more jobs in renewable energy in the state of Pennsylvania than coal, natural gas and oil combined,” he states in the film, a factoid that made me take note. Who would have thought? When I’m in Pittsburgh, as I was in October, one of my favorite places to hang out is the South Side. I enjoy taking walks along the South Side Riverfront Trail, all the way to Hot Metal Bridge, the last vestige of J&L Steel. The air is deceivingly clear. I say deceivingly because Pittsburgh’s air quality is still one of the worst in the nation, with a major contributor being the Clairton Coke Works of U.S. Steel, which has long been in violation of air pollution rules. “The EPA ranks areas downwind … in the top 2% nationally for cancer risk from toxic air pollution,” according to the Clean Air Council. Why doesn’t the company invest and clean up the plant? 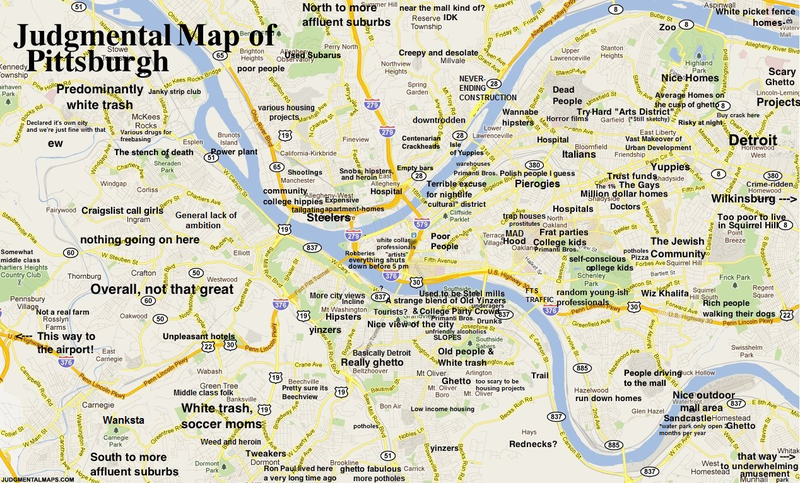 My native Pittsburgh and my adopted city of Paris both have a long way to go. Backwards is not a viable option. It’s true that Mr. Trump doesn’t represent the capital of France. But the U.S. is one of the top two polluters in the world, and when the smoke comes out of the pipe, it knows no borders. 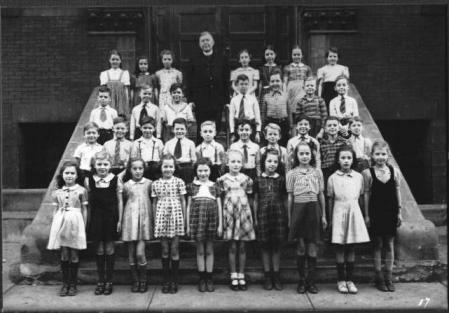 From Pittsburgh to Paris, there’s been one awful story dominating the news and troubling my mind in the past few weeks: the Pennsylvania grand jury report showing that more than 300 "predator priests" have been credibly accused of sexually abusing more than 1,000 child victims. Although I’ve known about these crimes for years, this time they hit home. I grew up Catholic and went to diocesan schools from 1st through 12th grade, St. Canice and Hilltop Catholic. During my four years in high school, four priests that I remember were listed in the report! That's not nothing. That's not a small problem. And the pastor was certainly involved in shuttling predators to other churches. Our alumni have been trying to make sense of it all via our Facebook group. I wasn’t a victim, but these crimes affect me deeply as a person of faith and mom. The child victims, now adult, cry out. What can be done to make our religious institutions for the faithful and not the fakes? Many of Hilltop’s alums say they’ve simply left the church. Or they are no longer donating. Or they try to distinguish between the church and the people. Or religion and faith. Stop shielding child sexual predators behind the criminal statute of limitations. Let older victims sue the diocese for the damage inflicted on their lives when they were kids. Improve the law for mandated reporting of abuse. Fourth, adopt a law concerning confidentiality agreements that makes them illegal for crimes. What I’m saying is do right by the victims and no more secrecy. What can we do? What are you doing? Let me hear from you. Here are some concrete steps suggested by David Clohessy, the former national director and spokesman for the Survivor's Network of those Abused by Priests (SNAP) in an opinion article in USA Today. Second, set up whistleblower reward funds. Catholics (by lay people for lay people) should band together to set up funds to financially help and emotionally support those who find the courage to speak up. Third, donate elsewhere. People in the pews should give generously, but not to their bishops. Instead, they should donate to independent non-profits that fight against child sexual abuse. Translation: Wake up people and do something! Lastly, I think the church needs to devote itself to its people instead of to its hierarchy. The Catholic Church should act as a beacon on the hill (Matthew 5:14) for the future of society. The only way our institutions (church, schools, political parties, you name it) will serve the people is if we vote with our feet and leave, or work inside them for change. Rose Marie Burke, an editor and lecturer at the University of Paris 8, writes a blog about her personal insights into life in Paris. After 20 years in the City of Light, she still calls her native Pittsburgh "home." You can also find her on LinkedIn, Facebook, or Google+. My best books of 2017 are an odd bunch but they have this in common: Once I got started, I couldn't put them down. Two graphic novels topped my list. “Isadora,” by Julie Birmant and Clément Oubrerie is a French biography of American dancer Isadora Duncan (1877-1927). I purchased this beautifully illustrated book at my neighborhood bookstore as a way to read more in French, and previously blogged about that here. The other illustrated book is the inspirational “Together is Better,” by Simon Sinek. He challenges us to be leaders who watch others rise, who cheer for others and watch them grow. That one I pinched from my husband who received it as a gift. Another one I “borrowed” was “The Power of Habit,” by Charles Duhigg. If you agree with the author, we are mostly the sum set of what we do each day, those ingrained habits from drinking several cups of coffee or not, from working out daily or not. Don't make resolutions, build habits. They stick. In the genre of French noir, I heard about the prize-winning novel “Chanson Douce” by Leila Slimani, on French breakfast TV and was intrigued by the plot: a perfect Mary Poppins of a nanny goes rogue and kills the little darlings. I knew how it ended, but wanted to see how the author got there. Chilling. Another chilling book was “Between the World and Me,” by the writer Ta-Nehisi Coates. It’s a love letter to his son about growing up black in the U.S. I can’t get into a black person’s skin, but I think this is the closest I can come to understanding how it must be. I bought that book at the great independent Harrisburg bookstore, Midtown Scholar. 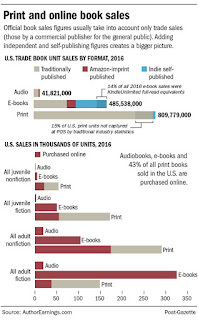 Why do I still read books? Because fiction or nonfiction, they open up my mind into the souls of others. 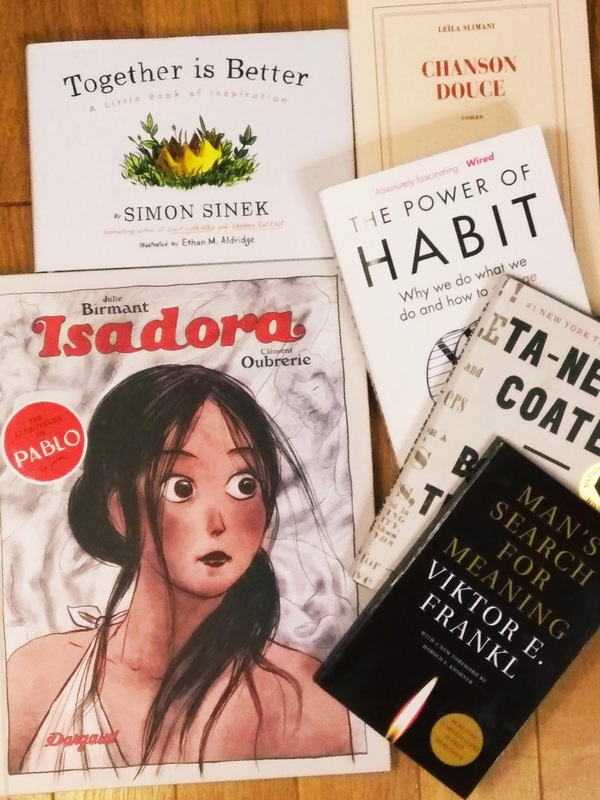 I'm challenging myself to read 18 books or more in 2018, inspired by Gretchen Rubin's idea to make a list of 18 things you'd like to do in the New Year. Any recommendations? I especially could use a recommendation for a book in German. What were your best reads of 2017? What do you have on the shelf for 2018? When Pittsburghers ask me about visiting Paris, some common questions are: What is the best neighborhood to stay in? Which are safe? Which ones should I avoid? I usually answer that unlike U.S. cities, where the urban core is usually seen as unsafe, in Paris it’s the opposite. Here, central Paris is safe and well-protected by France’s security forces, partly of the importance of tourism. Because the city is so rich, the poor have been priced out. 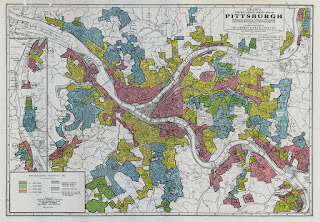 You’ll notice that Paris is more multicultural than Pittsburgh, which still suffers divisions from a long legacy of redlining. * In France, mixité, loosely translated as diversity, is a national value. I’m not saying the country has reached that goal—far from it. However, for a long time France has intentionally woven housing projects, called “social housing” here, throughout cities. 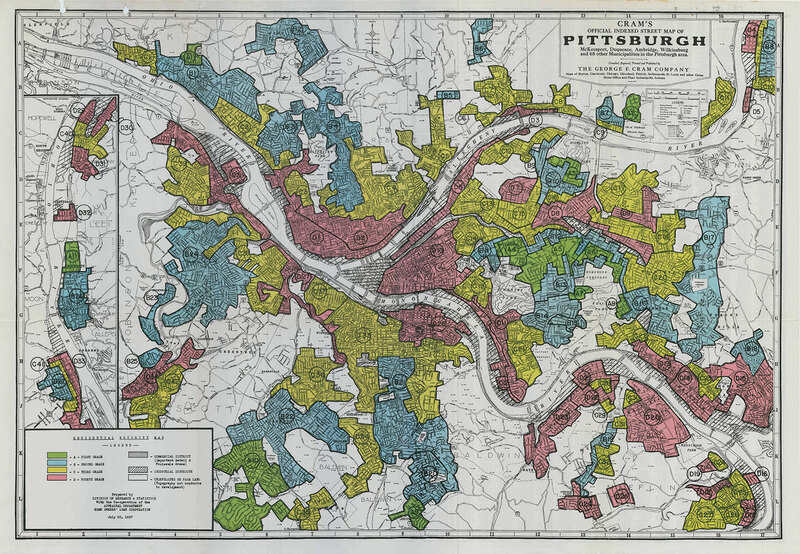 In contrast, intentional redlining in the U.S. created ghettos in Pittsburgh and other cities that only deteriorated over time. Even those Paris is through and through an amazing city, Parisians and long-time residents like me have maps in their minds of the “best neighborhoods.” When I moved to Paris, I wanted to live in the trendy Marais, but ended up in the staid 16th arrondissement, with a high concentration of pearls and poodles (so the joke goes). Knoxville was considered a second-tier or “blue” neighborhood according to the 1937 Residential Security Map (see below), which was the basis of redlining. Only new developments fell into the top “green” tier. My old 'hood started to develop in 1872 and its homes attracted many middle managers of the South Side steel mills as residents in the 1920s and 1930s. Blue neighborhoods "… as a rule, are completely developed. They are like a 1935 automobile still good, but not what the people are buying today who can afford a new one,” according to the Federal Housing Administration's description of the tiers. Well that’s harsh! The guidelines then go on to comment that banks typically impose tighter mortgage terms on blue neighborhoods than green ones. Getting a mortgage in a red area, the worst, was either impossible or expensive. Geez, there was no way for a neighborhood to go, except down! The silver lining to the long and horrible history of redlining is that housing prices in Pittsburgh have gone so far down over the decades that today the only way is up. Coming to Paris? 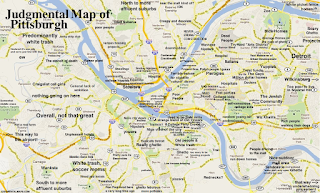 Moving to Pittsburgh? Explore, break down the lines, make up your own mind! *See Devin Rutan & Michael Glass (2017) The Lingering Effects of Neighborhood Appraisal: Evaluating Redlining’s Legacy in Pittsburgh, PA, The Professional Geographer. 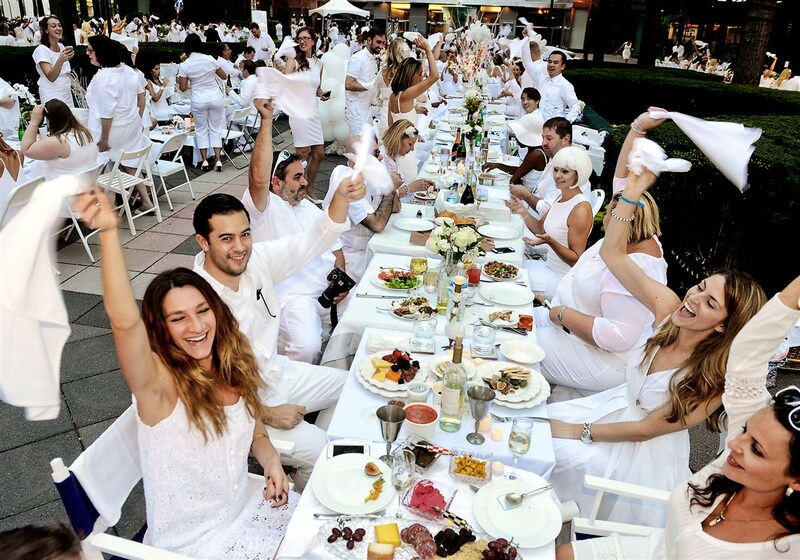 For the third year in a row, about 1,000 Pittsburghers on Friday dressed up in white to attend a very Parisian pop-up “white dinner” -- a Dîner en Blanc. The idea was born in the French capital in 1988 and has become a global phenomenon, with about 70 cities holding the event. It’s a formal version of the très Pittsburgh tailgater, a food fad that informally gathers sports fans around the end of a truck or SUV for a spread. In the 'Burg, the dress code is black and gold. The location of the White Dinner changes each year, and is kept secret until the last moment. In Pittsburgh this year, the flash mob assembled in Highmark Stadium in Station Square, the open-air room decorated with the city’s stunning skyline. Go here for video. While in Pittsburgh the food was catered for people who registered ahead of time, diners usually bring everything from the three-course meal, to the wine, fold-up table, tablecloths and candles. The first event started simply enough. The Frenchman François Pasquier invited friends to an outdoor dinner in a public park in Paris, the Bois de Boulogne. With a thought to practicality rather than refinement, he asked them to dress in white so they could find each other. These days, the event has unfortunately become more exclusive and regimented as the crowds have grown. It’s hard to get an invitation, at least in Paris, where the dinner takes place in June. Registrations for new members are closed. The only way to attend is to know someone, a member or an organizer. It’s easier in Pittsburgh, at least for now. Go to the website https://www.dinerenblanc.com/, choose your city, and pay: $34 for the dinner and $9 for the membership fee. Maybe I’ll just have a little old potluck at my place. Dress code: As long as you wear something, that’s fine with me. But please take your shoes off at the door. Photo: Pittsburgh's Diner en Blanc (2015). 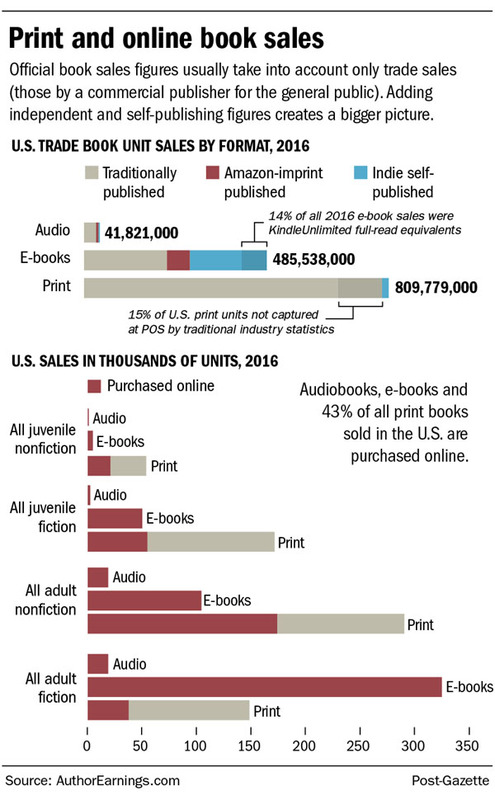 Source: Pittsburgh Post-Gazette. I watched in horror this week as “Harvey” turned from a hurricane into one of most devastating natural catastrophes to hit the U.S. Amid all of the destruction, however, were many acts of bravery. 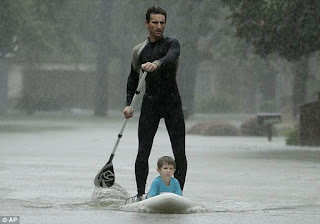 What warmed my heart was this paddleboard rescue. To me, the boarder symbolizes neighbors helping neighbors. I was going to say it symbolized Americans helping their neighbors, but in digging into the story I found out this man is actually a Parisian and moved to Houston only last year! As a fan of the sport, I could almost see myself out there like this Frenchman, braving the waters on dangerous missions, saving lives. In Pittsburgh this summer, I headed down the mighty Allegheny River on a paddleboard. I wasn’t there to pull people out of the water, but to enjoy it. We explored the beaches and calm coves of Allegheny Islands State Park, just a few miles upriver of the city, thanks to SurfSUP Adventures. The rowing was tough for me as we paddled against an undertow created by a small dam. Could I really rescue a person, even a small boy, against the worst that Mother Nature could throw me? Floods do occur in Pittsburgh. Over the course of its 250-year history, the city survived 15 severe floods that put downtown under water. However, since flood controls were put into place after the Great Flood in 1926, a 1-in-500-year event, the city has had only two 100-year floods since 1942. In Paris, we live a stone’s throw away from the Seine River on a flood plain. Last year, we feared the Big One. In June 2016, the Seine rose more than 18 feet above its normal level, but crested without threatening our apartment (see my post about that here). The river’s record high was nearly 27 feet above normal during the devastating floods of 1910. Some say that means we’re long overdue for a 1-in-100 year event, which would probably come up to our first-floor apartment—and disable of the heating and electrical equipment in the basement. We were assured that our apartment complex was designed to withstand a 1-in-500-year flood event. By contrast, Harvey is being called a 1-in-1000 year event. I can’t imagine either happening, but happen, I’m afraid, it will. These calculations aren’t forecasts, but are statistical averages that experts develop from historical data. But the times and the weather are a’ changing. In Pittsburgh, my paddleboard was an inflatable version, but felt solid as a rock. I hinted to my husband something about a Christmas gift. I could stow an inflatable board in my tiny place in Paris (if I clean out a few closets). It would be fun to paddle around the Seine once in a while. And who knows, one day I might need to rescue a small child—or myself.